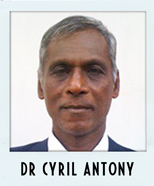 Dr Cyril Antony is a Sri Lankan and is a practitioner of Alternative Medicine such as Reflexology, Acupuncture, Acupressure, Reiki, Yoga Therapy, Thai & Chinese Massage, Shiatsu Massage and other massage therapies. He learnt Reflexology when he was studying Acupuncture at the Open International University for Complementary Medicines (OIUCM), Sri Lanka. Dr Antony has experience in Sri Lanka, Serbia, Thailand and Singapore. He has been practicing Reflexology for about 29 years and teaching Reflexology for about twelve years. He first joined the membership of the International Council of Reflexologists in 2010.